Globalization, HR and Business Model Success | Constellation Research Inc. The world is getting smaller and more global every day. Information travels at speeds and lower costs than ever seen before, with the expectation that information will only travel faster and that the costs to create, transfer, share and store information will only go lower. For enterprises, this means that business will be more global than ever before. While the brick and mortar reality was limited by the value of goods sold and the cost of transport, electronic commerce opens up a virtually unlimited window onto customers and is only limited by regulatory and shipping costs. In this report, Constellation evaluates how real the globalization trend is. 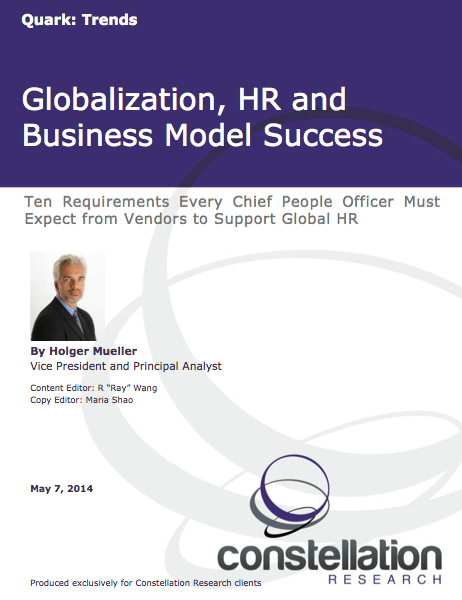 What drives human resources (HR) to become more global? What are the requirements for global HR systems that are future proof and support enterprises into and through the era of digital disruption on a global scale?